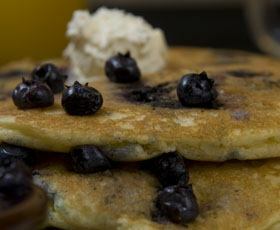 Become a Le Peep® owner today and put your own spin on our well established brand. What benefits are there to owning a successful, existing concept like Le Peep, rather than opening an original concept of my own? There are several benefits to ownership. When you pay for a license, you pay for the rights to an established, proven system and concept. We have spent years researching, testing, and perfecting systems for everything from operations, to training, to recipes. Instead of having to do this yourself and wasting time and money with hits and misses, you get to have all of that knowledge at your fingertips. We have valuable insight regarding what makes for a successful restaurant, which we share with you throughout the development process and the growth of your business. You receive manuals and training for all of it. Additionally, we have food contracts in place that will save you more money on your food cost than what your license fees to us come to. Name recognition, a network of fellow owners, and a support system from the corporate office all contribute to the value of ownership. There is plenty more, as well, that we would be happy to talk to you about! Do you give out territories to owners? You have the option of paying to reserve a territory. If you choose not to, we discuss with our owners what their development plans and goals are. If we agree with them, we will give you first right of refusal for an area that may fall within your planned development. So if someone else contacts us wanting to open a Le Peep there, we will first call and discuss it with you. If it is in conflict with your development plans and you have demonstrated an ability and intent to fulfill those plans, we will reserve that area for you. Our goal is always to work with our owners on this issue, as an existing licensee who represents us well is our preferred course of development in an instance like this. Call us for more detailed information about territories and related fees. What kind of training do you provide? Your training will take place in a working Le Peep restaurant, so that you can get real life experience as you learn. It entails approximately 7 weeks and covers every position in the restaurant. You will receive a Training Manual to study, as well as working each position. We do not charge you for the training, but you are responsible for your own living and travel expenses associated with it. Additionally, someone with training experience will come out to your restaurant for a week at your opening, so help your staff as they begin their new jobs, and to help guide you through opening week. Is there freedom to adapt the menu for local tastes and foods? Yes. Our trademarked and signature dishes need to remain the same on the menu. However, you are free to add dishes that you feel are beneficial to your market, as well as change the design of the menu as you see fit. You are also free to run specials that are not on the menu as you wish. What requirements are there regarding vendors, decor, etc.? As a licensee, rather than a franchisee, you are not required to use specific vendors for your products, nor are you required to use specific POS systems. Likewise, we do not require that your decor be done a certain way. We are happy to provide you with information regarding common color schemes, providers, equipment, etc. upon your request. However, the choice of whether to use them is yours. As long as you maintain the product quality for ingredients that our customers have come to relate with our name, you are free to choose your sources for them. What assistance do you provide through the opening process? We provide guidance with store layout, lease review, Letters of Intent, site feasibility, etc. This is non binding guidance based upon our experience. You retain the freedom to make your own business decisions based upon your research and your consultations with your own legal and financial professionals. What is the next step in becoming a Le Peep owner? 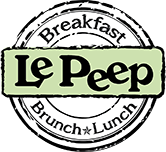 After 25 years with the company, I am proud to be the President and CEO of Le Peep, a company that has been and continues to be the forerunner in the breakfast and lunch segment. We are the original and best breakfast and lunch restaurant chain and have been setting a standard in this segment for over four decades. We use the freshest and highest quality of ingredients. We take pride in treating our guests with the best and warmest hospitality, to recreate that feeling like they are at a family member's house. I am dedicated to continuing the great tradition of success and innovative ideas. If this concept and my goals sound like what you are looking for and you want to be a part of our family and enjoy the Le Peep® life style with me, you may just find your place as a licensee. We look forward to hearing from you! Copyright © 2019 Le Peep ®. All Rights Reserved.